Unico National has accused Mafia II of racism for telling the story of an Italian-American organized crime syndicate. Italian-American service organization Unico National has spoken out against Take-Two Interactive's Mafia II, saying that the game is "a pile of racist nonsense" that perpetuates stereotypes of Italian-Americans as mobsters. Unico's Andre DiMino has demanded that Take-Two halt the release of the 2K Czech-developed game entirely so it can be "cleansed" of all references to Italians and Italian-Americans. 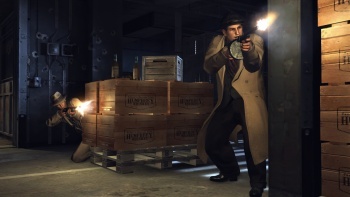 DiMino wrote to Take-Two chairman Strauss Zelnick saying Mafia II was an "inappropriate and insulting perpetuation of the pervasive and denigrating stereotype of organized crime being the exclusive domain of Italians and Italian-Americans." He believes Mafia II will "indoctrinate a new generation into directly associating Italians and Italian-Americans with violent, murderous organized crime, to the exclusion of all of the other 'mafias' run by other ethnic and racial groups," and that it is "unfairly discriminating and demeaning one group to the exclusion of all others." So he'd be fine with the game if it included gangs of other "ethnic and racial groups?" Are we seriously at the point where our videogames have to be politically correct in the way organized crime is portrayed? Should games like Mafia II become the equivalent of a Sunny Delight commercial so that the nation's youth can all feel like they have a chance to join a criminal syndicate when they grow up? Zelnick has responded to Unico's attack with this statement: "Mafia II tells a compelling story about organized crime in America -- a subject that for decades has been featured in movies, television shows and novels. Neither Unico nor any other organization purporting to represent Italian-Americans has seen or played Mafia II." He also points out that Mafia II is rated "M" for mature audiences and not marketed towards young people. Zelnick says that he stands behind his studios and products "fully and completely." What confounds me is how Unico doesn't seem to acknowledge that the Italian-American mafia is something that actually existed at a point in history, and should be fair game for exploration by any form of media including videogames. Mafia II is based around a topic set in reality, not something that someone dreamed up one day to defame Italian-Americans. I understand that Unico wants to prevent stereotypes from being perpetuated, but it's an unreasonable request for videogames to ignore a topic just because the organization doesn't like it.